And just like that, we’ve officially entered Generation 9 for gaming consoles. Sort of. Last night (or earlier today in Tokyo) Nintendo pulled back the veil on the Nintendo Switch, its upcoming handheld/stationary hybrid console and successor to the underwhelming Wii U. First up, the important bits: The Switch will launch worldwide on March 3—yes, less than two months from now—for a suggested retail price of $299. I say that’s the important bit because we pretty much knew everything else about the console from Nintendo’s October reveal. The Switch name refers to the device’s dual nature, both a traditional TV console and a mobile handheld. 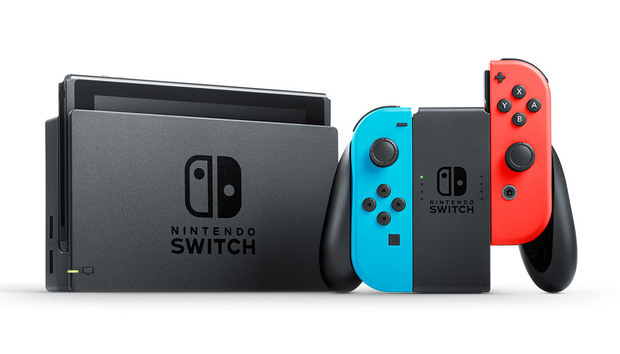 In its “docked” form, the Switch looks quite a bit like a Wii—a vertically oriented rectangle that connects up to your TV with an HDMI cable. The accompanying Joy-Con controller looks fairly traditional as well, like a blockier Xbox gamepad complete with offset analog sticks. Appearances are deceptive, though. You can actually remove the core of the Switch, revealing a tablet with a capacitive touch screen. And the controller? It breaks apart also, the two edges sliding out of the central “Joy-Con Grip” and attaching onto the sides of the tablet, basically recreating the Wii U controller. You can then take the Switch out into the world, with Nintendo touting between 2.5 and 6 hours of battery life. That’s a huge spread, so probably err on the side of 2.5 for most gaming purposes. And there’s a third way to play. Turns out the individual Joy-Con controller pieces also replicate the motion control functionality of the Wii, albeit in a smaller form factor. It’s fair to say most people came into the press conference just looking for a new Zelda and Mario though, both of which were revealed. Zelda: Breath of the Wild takes precedence, as it’s one of the few (four, apparently) launch games releasing alongside the Switch on March 3—finally tacking a date on a project everyone expected would release years ago. Oh, and it’s coming to the Wii U also, if you have one of those around and prefer not to buy into the Switch too early. There’s also a new Splatoon sequel, bringing the Wii U’s hit squid-kid shooter to Nintendo’s new console. The only problem? As of this fall, Nintendo will start charging for the Switch’s online features. Hence Splatoon might finally get released to a larger audience, but still be hobbled if nobody chooses to pay for Nintendo’s likely-shoddy multiplayer support. As for third party publishers, Nintendo ran through announcements forShin Megami Tensei, Xenoblade, No More Heroes, Skyrim, and FIFA, plus a highlight reel of a few other games (including Ubisoft’s recent snowsports sim Steep). Nothing really to make you think third-party support will be a critical part of the Switch’s life cycle, but that’s par for the course by now when it comes to Nintendo. And therein lies the rub, eh? After four years of the Wii U underperforming, there wasn’t much in Nintendo’s presentation to suggest it’ll do otherwise—except for the presence of Mario and Zelda. If you’re a fan, great, buy it for those. Like the Wii and Wii U though, the Switch seems like it’ll be used mostly for first-party titles and nothing else. We didn’t get any discussion of the Switch’s internal specs, but the games we saw looked more on-par with the Wii U than the launch PS4 and Xbox One—let alone the updated PS4 Pro and the Xbox’s upcoming Scorpio refresh. Don’t expect many tent-pole game releases to be ported to the Switch. Internal storage is also something I’m curious about, given the undersized hard drives inside the PS4 and Xbox One. With the Switch being part tablet, I can’t imagine there’s much drive space, especially at $300. Could be interesting. All in all, it’s a Nintendo console with Nintendo games. For some people that’ll be enough. For others, not so much. Not exactly the stunning endorsement some Nintendo fans hoped for, but it’s probably what we could’ve guessed. Head over to Nintendo’s site for more information, including the cost of replacing the Joy-Con controllers (a whopping $80 a pair) and more.